The increasing number of people who own smart phones has made it imperative for small businesses to claim their Google Places listings. According to statistics, there are 500,000 activations for both Google Android and iPhone units per day. What’s the link between small businesses and smart phones? When individuals make use of their Android phones to make a search, the first results which they will be able to see are Google Places listings. For those who aren’t really convinced with the figures just presented, the constructive arguments do not stop there. According to Google, 73% of all activity conducted online is associated with local content. Among those who search for local content, 82% of these individuals end up doing something whether that is following up through a phone call or visiting a store. Another study also asserts that 66% of Americans who have mobile phones make use of their gadgets to search for local businesses. Aside from Google Places’ popularity, another reason for why small businesses need to be more appreciative of this branch is because of its recent changes and improvements. You will easily notice the map which lists the various local businesses found in a certain city or town. But aside from the map, links to local businesses are also appearing above organic search results. In fact, aside from maybe two or three organic search results which are listed what follow are links to local businesses resulting in other organic listings are pushed further down the page. Also, Google has just recently launched Hotspot which allows users to recommend local businesses. With this new addition, it is much easier for users to patronize local businesses. Because of the increased attention that Google Places has received, marketing on Google Places has also become quite competitive. Unless if you have a hundred percent listing rating then you can say goodbye to your hopes of being listed as one of the first 7 local businesses. In order to get a 100% score, make it a point to fill out all of the different fields in your Google Places listing. Sometimes, the only reason for why local businesses do not make it to the first 7 is because they weren’t able to include a video or a picture as part of their listing. Reviews also help to boost your listing’s rate. 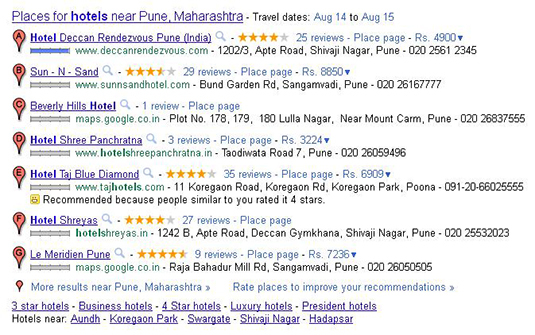 Encourage your customers to write a review on your Google Places listing to gain a higher rating.